There is a constant battle between pool builders trying to promote their own brand and products versus the brand and products of their competition. Almost every producer will tell you that the pools they offer are the best in the industry, demoting other pool types and brands to the best of their abilities. As a result, they lose the importance of focusing on their own business ethics. There are always pros and cons related to every pool type and brand. Ultimately, the final decision falls upon the buyer and should be based on extensive knowledge of any possible future issues of the selected pool product. Let's dissect each pool type together by looking at the initial cost, the benefits, and any accidental damage factors, offered warranty vs. reality, the long term financial impact, and the real estate value impact. 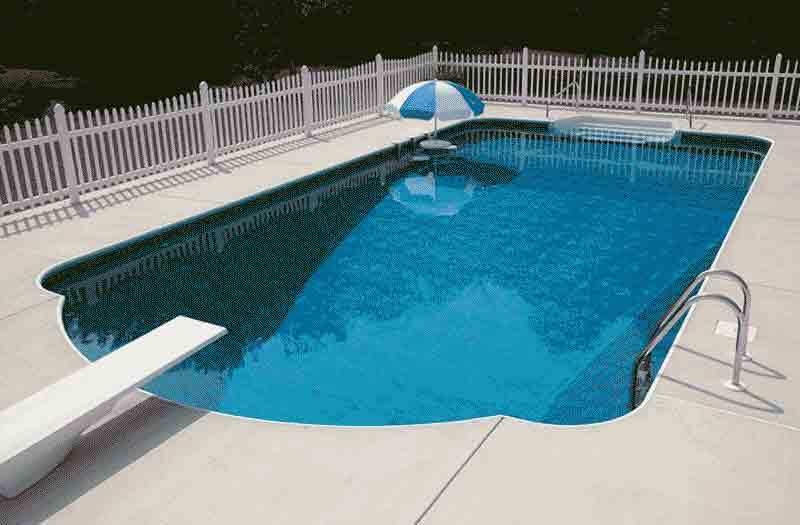 Vinyl liner pool type, in comparison to other types, is considered to be an entry level pool. Why entry level? The initial cost of the pool assembly kit is lower than any other type. By buying vinyl liner pool the buyer must be ready to disregard possible near future financial investments into the pool maintenance by getting the lower cost product today. Vinyl liner pool requires extra care to make sure that the liner material used to hold the water is in a good shape. Any small tear can cause the extensive repairs to become necessary, or even complete replacement of the liner. If damage to the liner is done by the end consumer than warranty will not cover the repairs. What can cause the damage you ask? Kids playing in the pool with some sharp objects, or pets trying to get out and reaping the liner with their claws, jumping to the pool and accidentally reaping the wall’s liner, rodent infestation behind the liner walls, etc. There is always a chance that the liner can be damaged one day and the pool will get shut off for a use. Also after first liner replacement it will never look like a newly done pool due to high possibilities of wrinkles on the surface, not mentioning that cost of replacement can be substantial. Due too many factors and variables that can impact the longevity of the pool liner we can only speculate on what is financial impact will be in 1, 2, or 10 years. Our opinions can only be based on the consumer’s responses over the past years and the use of logic. Each liner replacement outside of warranty will cost as an average $2,500 to $5,000 on the mid-size pool. How many time you would need to replace it? May be once every 5-7 years, or if you have kids, pets, rodents on the property etc… you could face very frequent liner replacement. Most of the Vinyl Liner pools don't have a transferable warranties. If you decide to sell your house the new homeowner will end up with the pool and no warranty! Vinyl liner pool can absolutely cause you an aggravation at the time of sale. High vulnerability level of the liner pool and higher maintenance factor have a direct reflection on your property’s selling point and even price. Initial cost of fiberglass pool construction is the highest in the industry in comparison to both vinyl liner and concrete. The cost of the larger fiberglass pool shell to the dealer in some instances might reach up to $25,000 before freight or any other expenses, not mentioning profit margin. Some manufacturers of fiberglass pools, due to some internal issues, might cut corners by using cheaper or experimental gel coat, or deviate from the industry accepted technologies of building pools by using different or less material, that’s why the decision of which brand to buy must be though through carefully and diligently, and the decision should not be based on WHO IS CHEAPER. Only few manufacturers offer the almost perfect gel coat color match repairs. Otherwise the color on the repairs cannot be matched no matter what anybody say. After time gel coat will get discolored at some level due to weather elements, UV light, and chemicals. Some pool brands will get discoloration sooner and some later. Pool sizes are limited by physical ability to deliver the pool. Some States will only allow to transport pools no wider than 16 ft. And the maximum depth of the pool cannot exceed 8’-6” due to transportation restriction also. All fiberglass pools are prefabricated and cannot be customized. 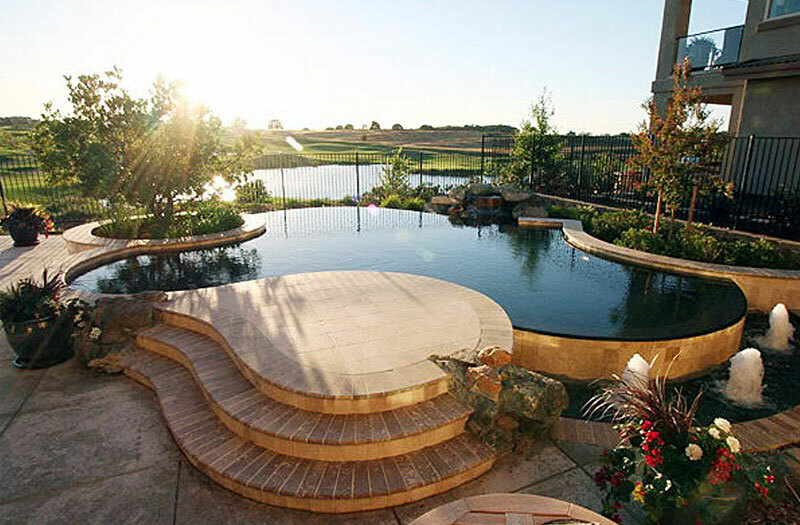 Few brands offer custom additions or components to their pools (modular pools). What is average fiberglass pool warranty vs. how long will the pool really last? There is no indication on any long terms negative financial impact on owning fiberglass pools, unless the pool was installed incorrectly, or fiberglass pool shell has been made by manufacturer in question. Considering low maintenance, product longevity, aesthetics and visual enhancement of the backyard Fiberglass pools, in general, do add value to a home. The National Association of Realtors has said that a concrete or fiberglass pool may add roughly 5% to a home’s value, but again, this number can vary. Looking beyond dollar figure, fiberglass pools often increase the sell-ability of a home, especially when the buyers have children. 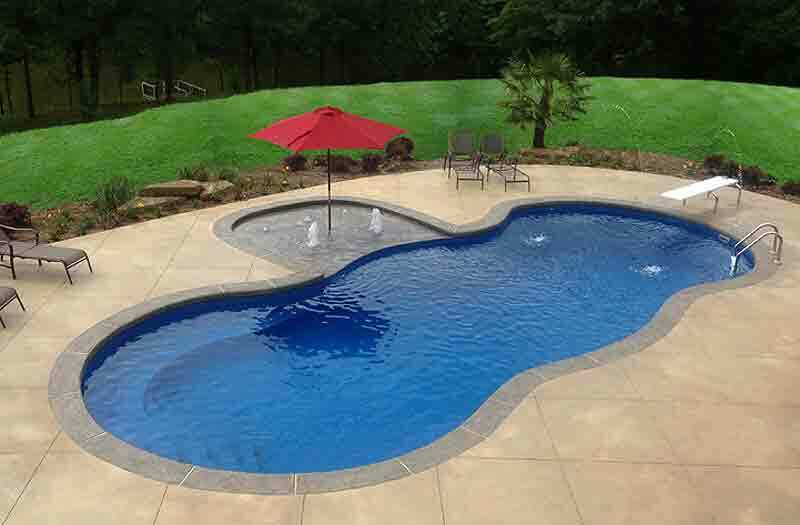 Initial cost of concrete pool construction is higher than fiberglass as well as vinyl liner. Concrete pools have very low rate of accidental damage factor as fiberglass pool. The surface scratches that might occur due to some misuse can be repaired. In case of structural damage concrete pool are almost impossible to repair. High cost overtime, since concrete pools will need to be renovated as often as 10-20 years. This involves resurfacing and re-tiling the pool at an average expense of $8k-$15k or much higher depending on the pool size and complexity. More chemical use, since the surface of concrete pools is very porous, more chemicals and filtration are required to prevent algae. The alkaline pH of the pool also constantly raises the pH of the water, requiring the frequent adding of acid to counteract the effect. More maintenance, since concrete pools also need to be frequently brush swept to remove algae from the pours of the plaster or aggregate surface. Long installation time. Concrete pools take much longer time to install, usually 2-4 months. Roughness of surface. The older pools get, the rougher they get, and bloody toes and knees are commonplace in these pools as the roughness increases. What is average concrete pool warranty vs. how long will the pool really last? Concrete pools (also called gunite) don’t have a manufacturer, they have a builder. Therefore they don't have a manufacturer warranty, only the workmanship warranty by the builder. You will solely depend on your builder rather than factory for the duration of the warranty, so you need to look at many variables of that company, such as longevity of the existence, possible chance of going out of business due to the size of the company and the age of the owner, number of pool installed annually since that would be the indicator of their financial stability etc. Also the quality of construction will directly correspond with who that builder is. If you decide to go with a newly formed company or just a group of laborers you should realize if something will happen to your pool you might not be able to find your original builder. There are also many companies (more than you want to know about) who are represented just one man, with nobody else at all, and all work is being done by various subcontractors. What kind of warranty you should expect than? There is a high long terms negative financial impact on owning concrete pools! Every $10+ years the pool must be resurfaced and re-tiled. Considering product longevity, permanent aesthetics and visual enhancement of the backyard, concrete pools do add value to a home. The National Association of Realtors has said that a concrete or fiberglass pool may add roughly 5% to a home’s value, but again, this number can vary. Looking beyond dollar figure, fiberglass pools often increase the sell-ability of a home, especially when the buyers have children.